Ever since switching to (expensive) organic milk, I'm even more mindful of making sure I use up every last drop of milk before it expires. Buying groceries is all about estimation. You do your best to judge how much lettuce you’re going to use between trips to the store, or how many bowls of cereal you’ll shovel down your gullet before the next trek to the Save-On. Sometimes you get it right, and sometimes you get it wrong. With canned and frozen food, you’ve got more time to use up any extras you don’t finish right away, but with things like bread, produce and dairy, you’ve got a limited window of freshness. I’ve always found milk usage one of the harder things to estimate. Part of the problem is that you never know how much you’re going to use in a week (will I use it for cereal, baking muffins, whipping up lattes for company? ), and part of the problem is the expiration date on the jug. The usage window isn’t always the same, and it depends on what the store has in stock. 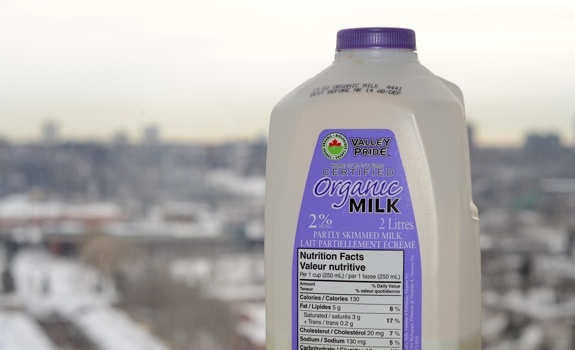 You may have a week to use up the milk, or you may have nearly a month. If you run out of milk, you can make a trip to the corner store for more. But what if you have too much milk, and you’re getting dangerously close to the expiry date? How can you use it up before it goes south? Pudding: A family favourite. A great way to use up a fair bit of milk while indulging in a yummy dessert. Keep a few boxes of pudding powder in the pantry, just in case. Cream of Wheat: Make it with milk instead of water, and serve it hot with a bit of butter melting on the surface. I can’t remember the last time I ate it, but writing this has made me yearn for a bowl of the stuff. It’s one of my childhood comfort foods. Chocolate Milk: Not my cup of tea (I’m more into chocolate soy milk), but a valid option for many. As long as you keep a tin of chocolate milk powder around (or a tin of Milo, if you’re more used to that in your corner of the world), you’ve got a great way to use up extra milk. Hot Chocolate: Winter’s favourite milk hog. I know a lot of people use water with their hot chocolate mix, but do yourself a favour and try it with milk. If you’ve got milk to spare, you’ve got nothing to lose. Café au Lait: Typically, half steamed milk (with or without a dash of milk foam) and half brewed coffee. Can work in an Americano format, too. The bigger the coffee, the more milk used. White Russian: If you’ve got milk, Kahlua and vodka, you’re set. The Dude wouldn’t abide wasting perfectly good milk, would he? Paneer: Indian-style cottage cheese. You can make it at home without too much difficulty. Only try this if you’ve got a fair bit of time and a whole lot of extra milk. Chai Latte: With a good pre-made chai tea concentrate like Canada Chai, it’s a simple ratio of one part chai concentrate, and one part milk. Heat it up in the microwave, and away you go. So, those are my tricks – how about yours? Why not leave a comment with your favourite way to use up extra milk? I’m curious to know what I’ve left out. One summer, my Mom and brothers and I looked after her brother’s farm while he and his famiy went on an extended holiday. Their milk goats were especially productive that year, so in addition to using some of the ideas you’ve listed, we made enough blancmange to float the Queen Mary. I think after nearly 40 years, I just might be able to face a bowlful of it again. Maybe. Goat milk? Ha! I wouldn’t even know where to begin with goat milk. 🙂 I’ve had — and loved — goat cheese, but I don’t think I’ve ever sampled goat milk on its own, never mind whipped into a blancmange.